Massimiliano Tomba received his Ph.D. in Political Philosophy from the University of Pisa. He is working as Senior Researcher in Political Philosophy in the Department of Political and Juridical Sciences and International Studies at the University of Padova. Currently, he is teaching a course on the Philosophy of Human Rights and Political Theory of Global Society for graduate students. His research interests concern modern political philosophy, with a particular emphasis on German classical philosophy, modern and contemporary political thought, critical theory (especially the Frankfurt School), and theories of the modern state. His work has involved theorists such as Kant, Hegel and post-Hegelian thought, Marx, Walter Benjamin, and Theodor Adorno. His current research and teaching focuses on the history of political thought and the themes of human rights, globalization, and the reconfiguration of time and space in a global horizon. His work has recently been directed toward the re-consideration of the Eurocentric paradigm that has for a long time structured analyses and interventions in discourses of human rights and globalization. His is interested in studying difference (social, cultural, economic, and political) within the context of a “plurality of temporalities” in relation and conflict with each other postcolonial scholarship and building on my previous work on temporalities in Marx’s thought, enables me to provide a critique of our habitual categorical schemes of interpretation. 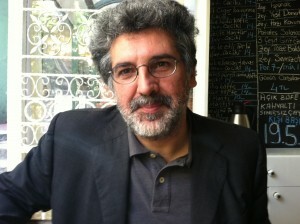 Among his publications are Crisi e critica in Bruno Bauer. Il principio di esclusione come fondamento del politico, Napoli, Bibliopolis, 2002; La vera politica. Kant e Benjamin: la possibilità della giustizia, Macerata, Quodlibet, 2006; Strati di tempo. Karl Marx materialista storico. Milano, Jaca Books, 2010 and, most recently, Marx’s Temporalities, Leiden, Brill, 2013.